How many US Presidents have been impeached? Which presidents were impeached? Discover the history of the Impeached presidents of the United States. This article provides interesting facts and information about the events surrounding the Impeached Presidents who faced serious charges and investigation by the Senate. How many US Presidents have been impeached? There are two Impeached Presidents, whose pictures are shown on your left. 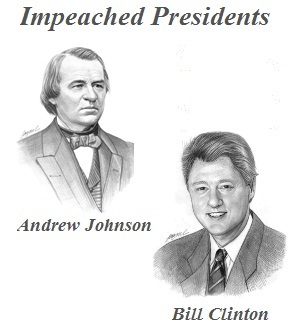 The names of the two Impeached Presidents are President Andrew Johnson and President Bill Clinton. President Richard Nixon is not included as he resigned before he could be impeached. The House of Representatives voted for a formal impeachment inquiry but in each trial, when the Senate deliberated the cases, both President Andrew Johnson and President Bill Clinton were acquitted. The words 'Impeach' and 'Impeachment' are rarely used in everyday conversation, so it is worth defining the meaning of both Impeach and Impeachment before reading the history of the Impeached Presidents. Definition of Impeach: What does to impeach mean? To impeach means to charge with a crime, misdemeanor, misconduct or misbehaviour in office by a public official, including the US President. The word impeach derives from a combination of Latin words meaning to hinder, shackle, catch and accuse. Definition of Impeachment: What does to impeachment mean? Impeachment is a a formal document charging a public official with misconduct in office. Impeachment is a criminal proceeding against a public official. Articles of Impeachment: Articles of impeachment are a device by which, in cases of impeachment, performs the same office which an indictment does in a common criminal legal case. The US Constitution: The Constitution of the United States refers to the process of Impeachment in Article II, Section 4. The Constitution states that "The President, Vice President and all civil Officers of the United States, shall be removed from Office on Impeachment for, and Conviction of, Treason, Bribery, or other high Crimes and Misdemeanors." Impeached Presidents: Why was Andrew Johnson Impeached? Impeached Presidents - Why was Andrew Johnson impeached? Andrew Johnson was the 17th president of the United States, whose term in office spanned from April 15, 1865 to March 4, 1869. The reason that President Andrew Johnson was impeached was for his removal of Edwin Stanton, Secretary of War in violation of the Tenure of Office Act. Impeached Presidents: The Impeachment of Andrew Johnson - What was the Tenure of Office Act? President Johnson suspended Edwin Stanton, the Secretary of War after a series of disagreements about Reconstruction that followed the American Civil war (1861-1865). Andrew Johnson, a Democrat, chose a moderate treatment of the rebellious South whereas Edwin Stanton, who had been a strong supporter of Abraham Lincoln, had extreme Republican sympathies. The Radical Republicans in Congress tried to protect Edwin Stanton who was openly opposing the President's Reconstruction policy. On March 2, 1867, Congress therefore enacted the Tenure of Office Act which stated that a president of the United States could not remove any official, originally appointed with senatorial consent, without first obtaining the approval of the Senate. In December 1867 President Johnson suspended Edwin Stanton. But Stanton refused to budge and barricaded himself in his office claiming that the Tenure of Office Act protected him. The radicals in Congress supported Edwin Stanton's assertions and that by the act of suspending Edwin Stanton and removing him from his cabinet, without the consent of Congress, President Johnson had indeed breached the Tenure of Office Act. The President's actions resulted in Impeachment Proceedings. In November, 1867, the Judiciary Committee voted 5-4 that President Johnson be impeached for high crimes and misdemeanors. 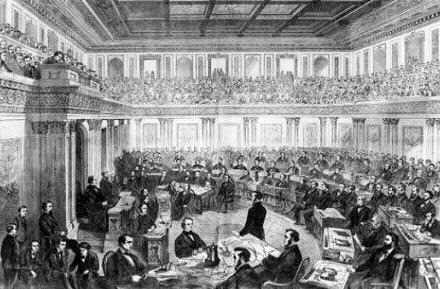 On 30th March, 1868, the impeachment trial of President Andrew Johnson began. The result of the impeachment trial was one vote short of the required two-thirds majority for conviction and the President was acquitted. 2. The Impeachment resolutions are referred to the House Judiciary Committee who decide whether the case should be referred to the House of Representatives. 3. The House of Representatives vote for or against a formal impeachment inquiry. 4. The House Judiciary Committee then conducts an investigation to determine whether there is sufficient evidence to warrant articles of impeachment against the President. 5. The House Judiciary Committee then drafts articles of impeachment with specific charges and evidence. 6. Articles of Impeachment are passed to the House of Representatives for approval and the President is impeached. 7. The trial of the President is held in the Senate with the Chief Justice of the Unites States Supreme Court presiding. The Impeachment trial is conducted in the same way as a court with witnesses and cross-examinations. 8. The Senate votes whether to acquit or convict the President. The final decision requires a two thirds majority (67 Senators). 9. The verdict of the Senate is final and there is no right of appeal. Impeached Presidents: Why was Bill Clinton Impeached? Impeached Presidents - Why was Bill Clinton impeached? Bill Clinton was the 42nd president of the United States, whose term in office spanned from January 20, 1993 to January 20, 2001. The reason that President Bill Clinton was impeached was due to a series of events that led him to make false statements about his sexual relationship with Monica Lewinsky and lying to the public, obstructing justice and invoking Executive Privilege. Impeached Presidents - The Impeachment of President Bill Clinton: The reputation of President Clinton had already been brought into question by the Whitewater Scandal. The Senate Special Whitewater Committee had issued a report on June 18, 1996, which only hinted at one possible improper action by President Clinton, but spoke of the "American presidency misused its power, circumvented the limits on its authority and attempted to manipulate the truth". Impeached Presidents - The Impeachment of President Bill Clinton: The story of impeached President Clinton originated in a sexual harassment lawsuit brought in 1994 by Paula Jones, a former Arkansas state employee. The name of Monica Lewinsky, a young White House intern, came to the fore due to a deposition by Linda Tripp, who also worked in the White House. The American public first learned of allegations of a Clinton affair with Monica Lewinsky on January 21, 1998. President Bill Clinton then consistently denied all allegations of improper sexual conduct with young members of the White House staff. On December 12, 1998 The House Judiciary Committee approved 4 articles of impeachment, relating to perjury before the grand jury, perjury in a civil deposition, obstruction of justice and abuse of executive power. On December 19, 1998 the House of Representatives approved two of the articles of impeachment relating to perjury and obstruction of justice. The impeachment trial formally opened in the Senate on January 7, 1999. The impeachment trial ended on February 12, 1999. President Bill Clinton was acquitted by the Senate who voted 45 to 55 for conviction on the perjury charge and 50 to 50 for conviction on the obstruction of justice charge. The Senate was therefore unable to reach the two third majority to convict and President Clinton finished out the remainder of his term in office. The House Judiciary Committee issued three articles of impeachment against President Richard Nixon on July 30, 1974, but he resigned before the impeachment process could continue to trial.